Dr Mervyn Koh, who heads Tan Tock Seng Hospital’s palliative medicine department, said more patients are requesting palliative care consultations, which was unheard of five to 10 years ago. “Families want to know what to expect as the patients’ health deteriorates, and what symptoms they will be having,” he said. 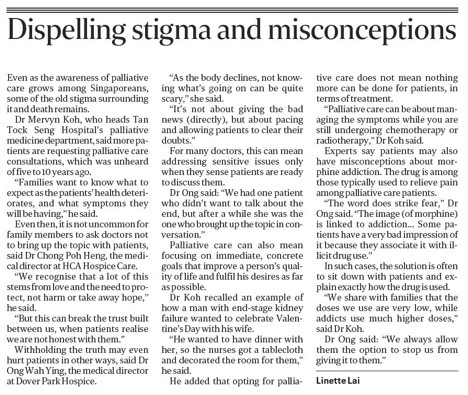 Withholding the truth may even hurt patients in other ways, said Dr Ong Wah Ying, the medical director at Dover Park Hospice. “As the body declines, not knowing what’s going on can be quite scary,” she said. For many doctors, this can mean addressing sensitive issues only when they sense patients are ready to discuss them. Palliative care can also mean focusing on immediate, concrete goals that improve a person’s quality of life and fulfil his desires as far as possible. Dr Koh recalled an example of how a man with end-stage kidney failure wanted to celebrate Valentine’s Day with his wife. “He wanted to have dinner with her, so the nurses got a tablecloth and decorated the room for them,” he said. He added that opting for palliative care does not mean nothing more can be done for patients, in terms of treatment. “Palliative care can be about managing the symptoms while you are still undergoing chemotherapy or radiotherapy,” Dr Koh said. Experts say patients may also have misconceptions about morphine addiction. The drug is among those typically used to relieve pain among palliative care patients. In such cases, the solution is often to sit down with patients and explain exactly how the drug is used. “We share with families that the doses we use are very low, while addicts use much higher doses,” said Dr Koh.